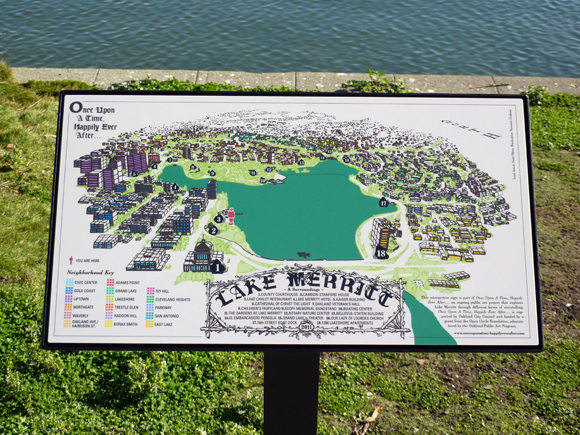 The Lake Merritt & Surroundings Map is located below the Camron-Stanford House near the intersection of 14th St. and Lakside Dr. Historically significant buildings and the surrounding neighborhoods are identified in this bird’s-eye, perspectival view of Lake Merritt. 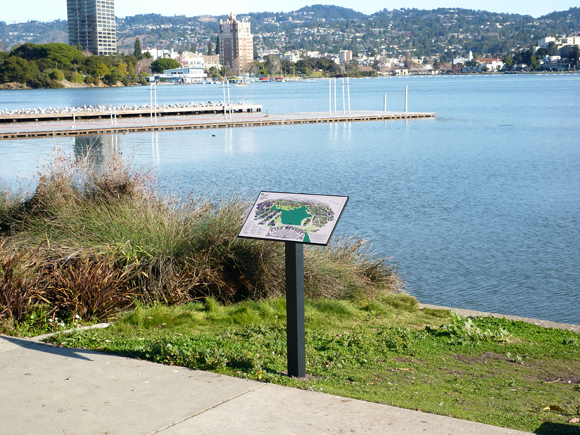 The Lake Merritt Watershed Map is located at the top of the northwest arm of the lake, near the intersection of Harrison St. and Grand Ave. This detailed map shows the entire Lake Merritt Watershed, highlighting such features as creeks and storm drains, topography, and historic shorelines. 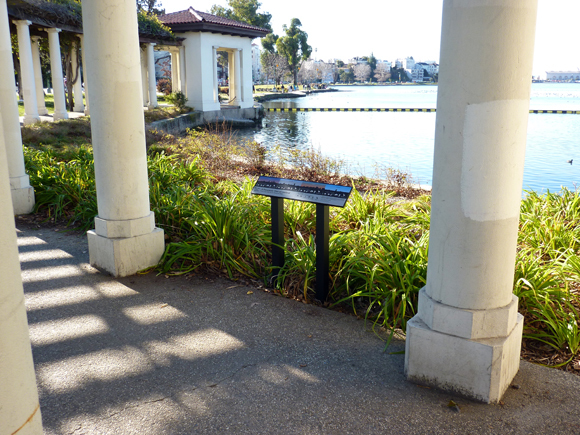 The Lake Merritt Panorama Map is located in the "El Embarcadero" pergola at the top of the northeast arm of the lake, near the intersection of El Embarcadero and Lakeshore Ave. The data overlaying the city skyline in this map shows seasonal fluctuations in average rainfall, Canada Geese population, pounds of trash removed from the lake, and more. 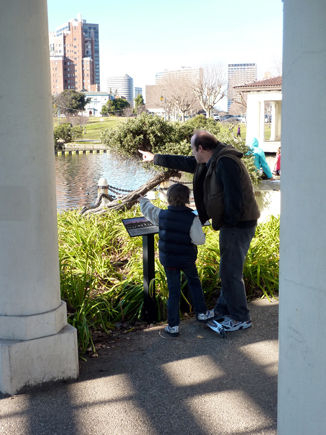 Passers-by interacting with the Lake Merritt Panorama map. 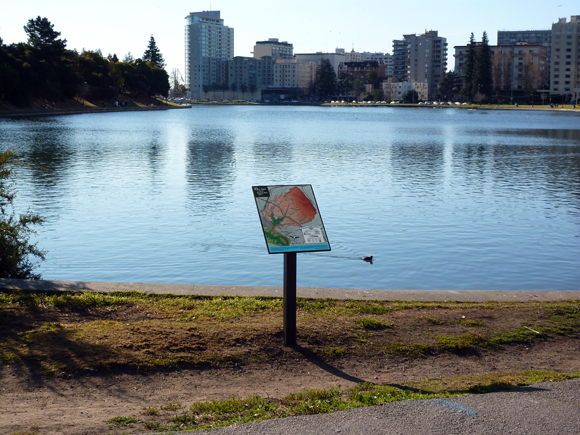 The Walking Lake Merritt Map is located just north of the 18th St. boat dock near the intersection of E. 18th St. and Lakeshore Ave. This map shows the paved pathways and public green spaces around Lake Merritt. It also shows the location of each of the storm drain outlets to the lake. 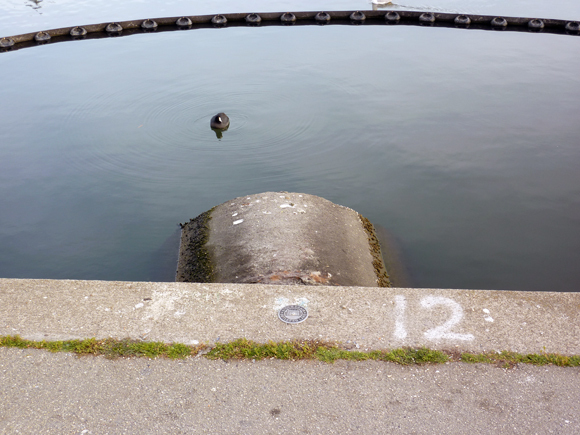 One of the largest and most visible storm drain outlets can be seen here, poking out of the water just beyond its marker. 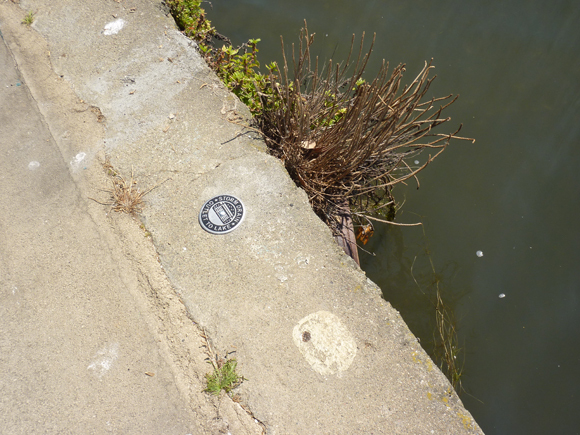 Another of the sixty-two storm drain outlet markers installed along the sea wall at Lake Merritt. 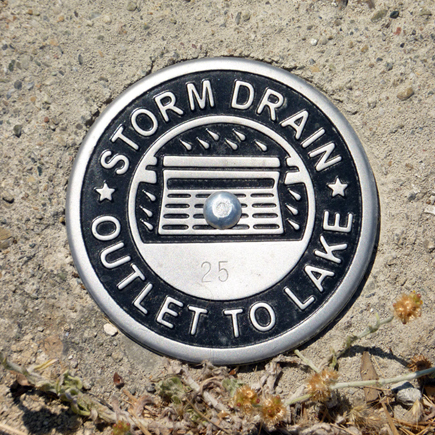 Each storm drain outlet marker is stamped with a serial number to make locating spills easier. The interpretive signage designed as part of Once Upon A Time, Happily Ever After… includes four interpretive “maps” and sixty-two storm drain outlet markers. Each of the maps is stylistically distinct and presents different types of visual information and data. Links to PDFs of the maps can be found below. The Lake Merritt & Surroundings Map focuses on architecture around the lake—identifying significant buildings and the surrounding neighborhoods. 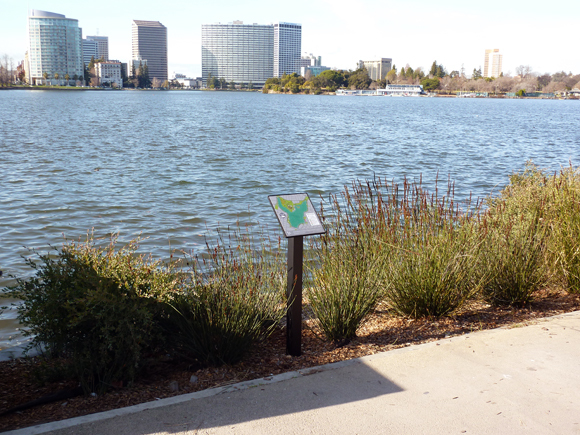 The Lake Merritt Watershed Map provides an even broader view, encompassing the entire watershed. It shows all the creeks and storm drains that feed into the lake along with the accompanying topography. This map also describes historic features circa 1850, such as the shoreline and wetlands areas. 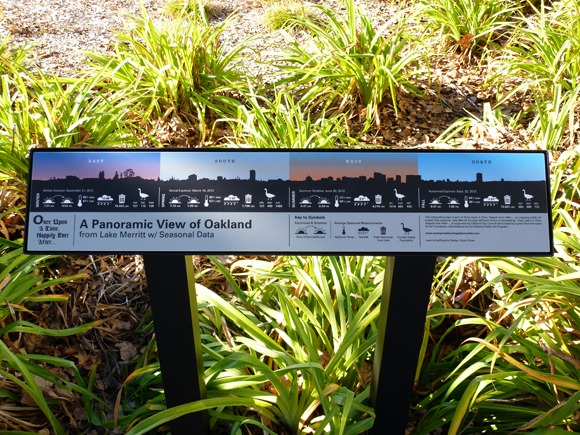 The silhouette of the Oakland skyline that appears in the Lake Merritt Panorama Map is derived from photos taken from the middle of the lake. The overlaid data shows seasonal fluctuations in average rainfall, high and low temperatures, Canada Geese population, pounds of trash removed from the lake, and sunrise and sunset on the 2012 equinoxes and solstices. 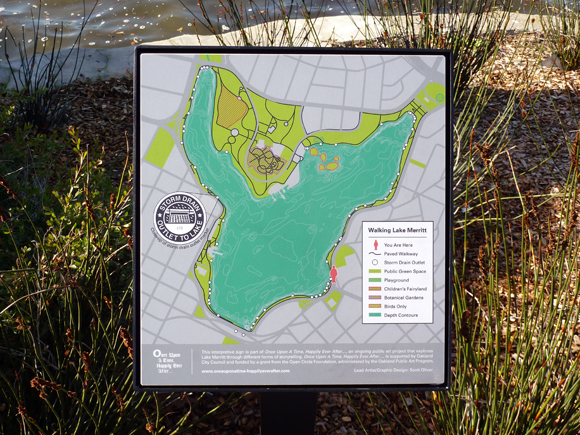 The Walking Lake Merritt Map shows the paved pathways and public green spaces encircling Lake Merritt. It also shows depth contours (the lake is about 15 feet at its deepest point) and the location of each of the sixty-two storm drain outlets. The markers themselves are identical except for serial numbers stamped into the face of each one. Most of the storm drains and culverted creeks that empty into Lake Merritt are invisible. They are none-the-less part of an important underground network that physically connects a seven square mile area and over 50,000 Oakland residents to Lake Merritt and, in a round about way, to one another. In addition to carrying fresh rainwater from the streets of surrounding neighborhoods to mix with salt water from the bay, the drains also carry what’s referred to as “urban runoff”—plant debris, trash (21,160 lbs. of it was removed from the lake in 2008 alone), and other pollutants like paint, soap and motor oil. The network of storm drains is an apt metaphor for the less visible ways in which the physical environment of the city, our lives, and natural phenomena are all interconnected and inextricable, elements of place. 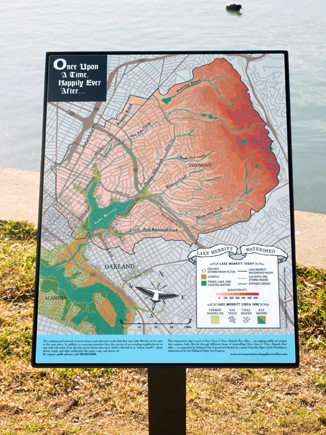 The interpretive signs are meant not only to illuminate that complexity but also to provide a specific and enriched context within which each visitor can establish or maintain a connection to the place we call Lake Merritt.